The official start of spring is just around the corner. 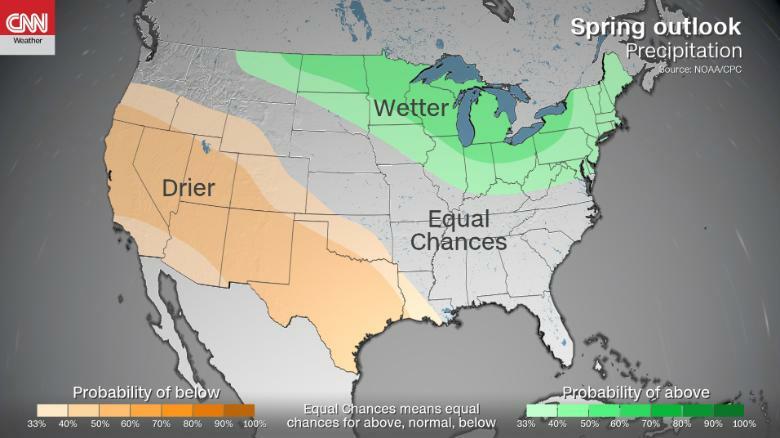 This turn of the seasons generally brings warmer temperatures and more rainfall — but what does spring have in store for your part of the country? 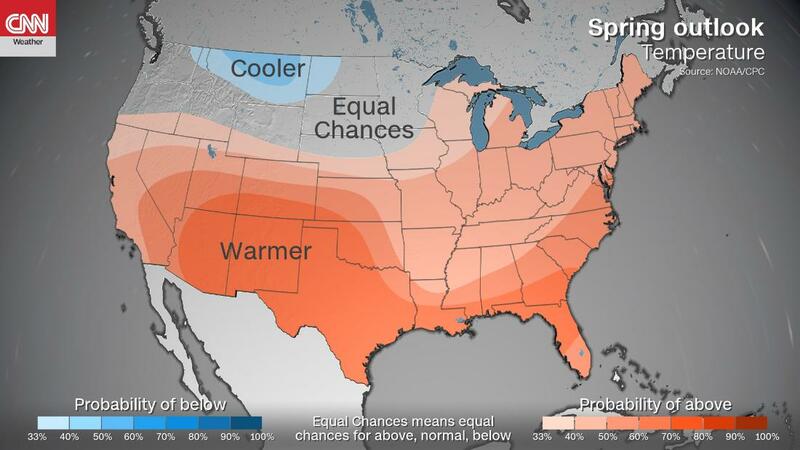 The National Oceanic and Atmospheric Administration, or NOAA, released their three-month spring outlook Thursday, giving us an idea of what we should expect from April to June in terms of temperatures, droughts and floods. A majority of the US should expect warmer than average temperatures, especially across the Southwest and Gulf Coast. These warmer temperatures will be a welcome change across the Northeast, after millions were hit by heavy snowfall from three nor’easters in the past 2 weeks. Colder than usual temperatures are only forecast across parts of the northern Rockies. Places like Amarillo, Texas have seen only trace amounts of rain over the past few months, and not much is expected to change, as dry conditions are expected to continue across the Southwest and central plains. California is also expected to be drier than usual, a cause for concern as wildfires will likely continue to be a major concern. Meanwhile, wetter than normal conditions are expected across the northern US — improving drought conditions across the lower Missouri Valley and northern plains. Flooding season started early this year across the Ohio and Mississippi River Valleys, and it is not expected to let up anytime soon. “Throughout May, moderate flooding is likely in the lower Mississippi Valley, parts of the Ohio River Basin, the Illinois River Basin, and in parts of the lower Missouri River Basin,” NOAA mentioned in the report. This is following the heavy flooding that occurred across the Mississippi River Valley beginning in mid-February. Additionally, minor flooding could occur early this season in parts of the Northeast as snow accumulation from the past three nor’easters melts. Although spring is just around the corner, winter may not be over just yet — computer models are showing yet another nor’easter in the works. This could bring another round of heavy snow and strong winds to the storm-weary citizens of the Northeast. But according to NOAA, milder temperatures are just around the corner.